THISTLE is a timeless Flag Blue classic Hinckley H-48 Yawl offered by Hinckley Yachts in Annapolis, Maryland whose sailing characteristics must be experienced. She was completely refitted in 2006, including new 2006 Yanmar engine, to comply with the stringent Bermuda offshore sailing regulations and also met the stringent requirements for the 2008 Newport to Bermuda Race. Great headroom, with a layout plan that includes Forward and Aft Staterooms and two Heads. Easily shown. United Yacht Sales New Jersey would love to guide you through a personal showing of this 48' Hinckley H-48 Yawl 1972. This yacht for sale is located in Deale, Maryland and priced at $249,000. For a showing please contact us by filling out the form on this page and we will get back to you shortly! THISTLE is a keel/centerboard Hinckley 48 Yawl and can sleep 8 in three cabins. This classic traditional interior has 6' 9" headroom in the main salon, is finished in varnished mahogany with varnished teak and holly sole and also has custom finished caned-locker doors. One piece molded hand laid fiberglass hull. Deck, deckhouse, and cockpit are fiberglass molded in one piece with the deck balsa core molded providing a light but rigid structure. Deck is set into a 6” flange in the hull, then fiberglassed and bolted in place. Nonskid pattern is molded into the deck and the sail locker seats. Keel: External 10,600 lb. lead keel is fastened with Everdur bolts. Centerboard: Bronze 940 lb. centerboard with Hinckley worm-gear lift with override - Electric with manual back-up. Stainless steel stem head with bow roller. Stainless steel bow and stern pulpits. Stanchions and double lifelines and gates. Varnished teak toe rails, dorade boxes, handrails, aft lazarette box and covers and cockpit coaming. Double dorade forward with stainless steel dorades painted white inside with a varnished teak storage box between. Stainless steel mast guard rail port and starboard. (2) Hatches with varnished teak boxes and translucent covers. Deck mount for spinnaker and whisker poles. Large opening cockpit seats double as water-sealed storage bins and sail lockers. Molded in nonskid on seat tops. Engine controls, sheets, and winches are all easily accessible. Binnacle mounted compass with cover. Hinckley cockpit dodger with window. Hood Awning - mainsail awning cover. Forward is the varnished teak hatch that leads to the interior accommodations below. (2) Opening hatches, (4) ports (including two-opening ports) and the companionway hatch provide natural light and ventilation. Wide berths are port and starboard. Drawer and drop-front storage under the berths. A seat is inboard the berth. Large opening port to the cockpit. Marine head, plumbed to holding tank. Separated from the next forward full-width Main Salon by half bulkheads. Convenient to Cockpit and Dining area. Countertop double-hatch accessed 9-cu/ft. refrigeration (engine or 12-volt driven) with ice cube trays. Shipmate gimballed 3-burner propane stainless steel stove with oven - stove cover stowes behind stove. Lockers and shelf stowage outboard. Double stainless steel sink with fixtures, sprayer and pressure hot and cold water. Bin storage outboard the sink that is countertop hatch accessed. Mahogany nav table with white formica top and multiple chart drawer storage. Autohelm 5000 autopilot with HD linear. Garmin hand-held GPS - with stainless steel mount at pedestal. Full-length port and starboard integral handrails under windows. Opening overhead hatch with screen, allows more natural light and ventilation. Cushioned settees/pull-out transom berths and a pilot berth outboard each settee. 6-Drawer storage under each fixed berth. Shelf outboard, port and starboard. Hinckley gimballed, varnished mahogany dining table - with drop-leafs. The port forward bulkhead has a varnished mahogany bookcase. Forward starboard in the Main Cabin is a full-length hanging locker with shelves. Shower with mixing valve and hot and cold pressure water. White formica countertop on the varnished mahogany vanity. Marine head has stainless steel custom holding tank with pump-out plumbing and “Y” valve. FORWARD STATEROOM: This private Stateroom is finished in varnished mahogany and has a solid mahogany door. Drawers and stowage under berths. Forward access to the divided chain locker forepeak. Natural light and ventilation from opening hatch over. Famit Marine aluminum main and mizzen masts and booms (1994 - Overhauled and Awlgripped). Standing rigging of 1 x 19 super stainless steel wire to Stalock terminals, internal halyards (1993). Spinnaker gear, including twin spinnaker poles and a reaching strut. New (2000) running rigging including main, spinnaker and staysail halyards, new main and genoa sheets, furling line, and topping lift. #22 SS main sheet winch. #22’s SS on mast winch. SST reef winch on boom. SS main halyard wire winch. Newest set of sails 2006. Hood Mainsail - Fully-battened, with 3 reef points, shelf foot and flattening reef. (4) 12-volt 450-amp/hr house batteries. Shore power and shore power cord. Generator: Next Generation UCM2-515 generator - 175-hrs 7/2007. 2001: Monel shaft and Max prop. (2) Engine alternators: 110-amp and 45-amp (Engine 45-amp alternator, rebuilt 2000). Allcraft 12-gallon hot water heater (new 2000) from engine or electrical system, located under the companionway steps. Stainless steel holding tank (new 2000) with pump-out plumbing for Y-valve. *Both heads rebuilt Winter 2000-1. Spare parts list includes: engine parts, steering cable, backstay, rigging items. Whale double-action bilge pump - by helm. Edson 18” diaphragm bilge pump. Fixed Halon automatic fire extinguisher. CQR 60# anchor - mounted forward in bow roller. Custom stainless steel boarding ladder. Hull was filled, faired and Awlgripped Flag Blue. Cowls rechromed and painted. 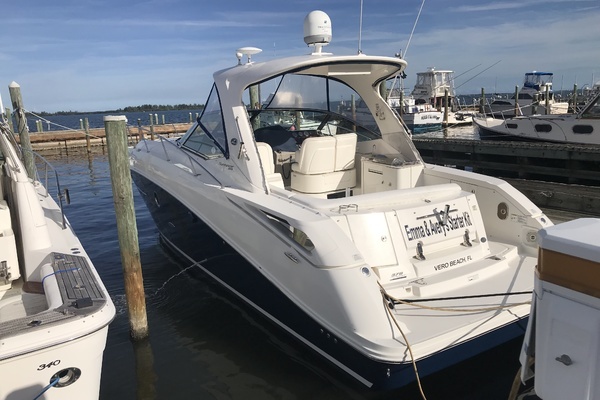 New: Watermaker, hot water heater, monel shaft & 3 blade Max prop, safety glass to main cabin large ports, nay lights on bow pulpit, all hoses replaced & re-clamped, fuel gauges & senders. Re-bedding coamings, aft hatches re-glued, aft head, galley and chart table area, main salon and fo’castle wooded, stained and 7 coats of varnish, new moldings and flooring in heads, caned-front cabinets throughout, tool locker under companionway steps, new teak companionway hatch cover, teak gratings. THISTLE is captain maintained and ready to sail away today. She is easily seen in the water at her Oxford, Maryland location.